We have a passion for restoring marble and limestone to its best possible condition. From polishing floors and repairing countertops to cleaning and sealing backsplashes, island tops and bar tops, we can get your kitchen showroom ready. When it comes to bathtub surrounds, walls, and showers, our expert technicians know how to deep clean and sanitize so your surfaces sparkle once again. We also clean, seal, and refinish marble and limestone in outdoor kitchens, pool and patio areas, and other outdoor living spaces, including hot tub surrounds, exterior walls, stairs, waterline tile, and much more. Does your marble or limestone have dull areas associated with wear patterns, scratches, etches or spots? Certified Stone Professionals can hone your stone surfaces to eliminate these imperfections, revealing the new surface underneath. 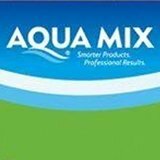 Using the appropriate diamonds or polishing powders to restore the finish you want, whether matte, semi-gloss or gloss finish. With our honing and polishing services, our expert technicians can achieve the exact finish you are looking for. Are your marble or limestone tiles uneven? Do you want your tiles to be flattened to the grout lines to facilitate easier cleaning? We can grind away the excess stone (a process called lippage removal) to create a flat, level surface using state-of-the art diamond grinding technology. Certified Stone Professionals can remove rust, stains, and discolorations on your marble or limestone. We can answer questions if you want to attempt DIY stain removal, or we can remove the stain for you. Cleaning processes for marble and limestone vary based on the surface condition and type of dirt or oil being removed. Regardless, one thing is certain. 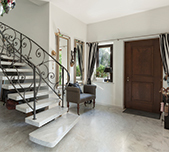 It’s easier to keep marble and limestone clean and elegant with periodic professional deep cleaning services, using non-acidic, highly-effective cleaning solutions. Once we finish cleaning and restoring your stone, we highly recommend you have us apply a sealer to inhibit staining. While most stains can be removed, it’s best to avoid the time-consuming, expensive and often frustrating process of stain removal by having your stone sealed. We can fill holes and fix cracks and chips, expertly blending the repair site with the surrounding area, and honing and polishing it to match the finish on the rest of your marble or limestone. Although it is rare for a marble or limestone tile to be beyond repair, sometimes tile replacement is necessary. Our craftsmen can, in many cases, remove your affected tile without damaging neighboring tiles, install the replacement tile, level it with the surrounding area, and then match the finish as closely as possible. 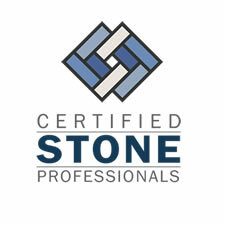 At Certified Stone Professionals, we can instruct you on the proper day-to-day care of your floors, countertops, and other surfaces. We offer a free, downloadable Care Guide and can recommend Care Products to help you keep your home or business looking great. We also provide a regularly scheduled maintenance program, upon request. 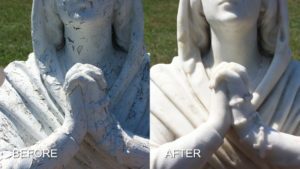 See our work: Weathered Statue Beautifully Restored, Acid-Burned Shower Restored, and Marble Floor Polished. For a FREE estimate on professional marble and limestone honing, polishing, cleaning, sealing, and other restoration services throughout Western New York, including Rochester and Buffalo, contact us online or call (716) 759-4200 today.